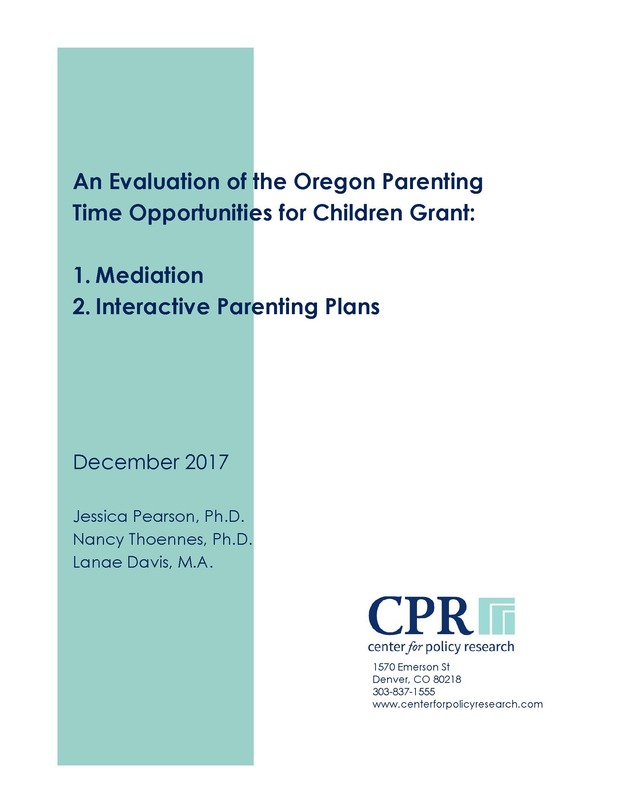 Oregon received one of the PTOC grants and proposed to use two distinct approaches to extending the opportunity to create a parenting time plan to parents with child support cases. One approach was the creation of a network of mediators who would provide never-married, low-income parents the chance to mediate a parenting-time agreement. The project was housed with Oregon’s child support system. The second approach was the development of an interactive web-based program that parents could use to generate a parenting plan. The Center for Policy Research (CRP) of Denver, Colorado, was retained to conduct a distinct evaluation of each approach that the Oregon Department of Justice pursued. This report presents the results of both studies. * Discretionary Grants for Parenting Time Opportunities for Children in the Child Support Program. Child Support Fact Sheet Series Number 14. Office of Child Support Enforcement Administration for Children & Families U.S. Department of Health and Human Services.